Working from home or living at the office? “I finally found a way to sleep in my office. Under the desk. I lie on my back. I tuck in the chair. I’m invisible.” – George Costanza, Seinfeld Season 8 Episode 18 “The Nap”. I’m a big fan of working from home. For as long as I’ve been working I’ve been doing it at home in some shape or form. 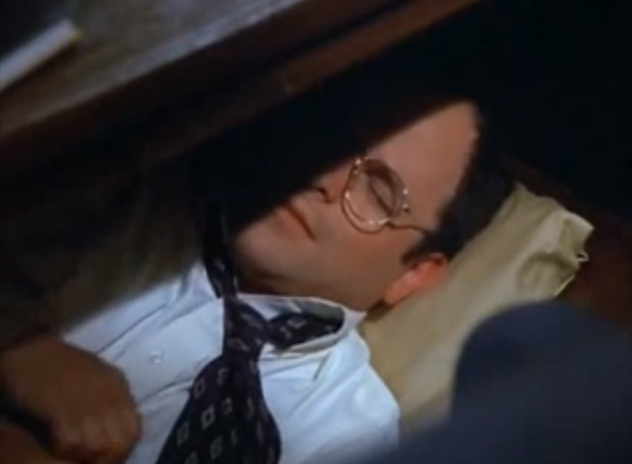 In the early days of my consulting career I did it so I didn’t have to sleep under my desk like George Costanza. In more recent years I did it so that on days I took my kids to school and picked them up I didn’t waste the rest of the day commuting to the city. Its not for everyone I know, but I always said “I would rather work from home than live at the office”. When your office and your home are in separate places you have natural geographic boundaries. You are physically ‘at work’ or ‘at home’. When they become one and the same you have to find another way to create physical boundaries. Some people set up a home office in a separate room of the house but this wasn’t really an option for me so I have found setting up a workstation is just as effective. Granted, its a laptop stand on top of an empty nappy box but hey, it works for me. I figure if companies like Google and Apple started in a garage, there’s no reason mine can’t be founded on top of an empty nappy box! Importantly, I can assemble and dismantle my workstation at the start and end of each day which creates a physical boundary that tells me (and my family) when I’m ‘at work’ and when I’m ‘at home’. Of course, the physical boundary is only half the story. We’ve all had those moments where the ‘lights are on but nobody’s home’ (when either we or the person we are with are physically present but mentally absent). This is definitely still a work in progress for me but I have started being much more deliberate about ‘being mindful’ so that I can master ‘being present’. Google is a much better authority on these topics than me if you are interested, but suffice it to say by simply practicing ‘mindfulness’ techniques like being aware of your breathing, you get much better at being present. When I am working I am present in my ‘office’ and not distracted by my ‘home’. When I am ‘home’ I am present with my family and myself, and not distracted by my work. As the saying goes, “if you love your work, you never work another day in your life”. Starting a new business has forced me to get very clear about not only what am I good at but what I love. After all, it would be a tragic waste of an opportunity to start a business in something I hate! But that doesn’t mean I love every aspect of my work. Like any meaningful pursuit in life, it requires effort, discipline and commitment which means pushing myself to do the things I may not like as much as other things. Even before I started my own business though, I’ve always loved my work. Or at least when I haven’t, I’ve changed it. Sometimes by changing the employer, sometimes by changing the job or sometimes by changing the way I approached the job. The bottom line is if you don’t love your work you will find it very hard to work from home. There will always be something more appealing at home, be it family, friends or even the washing! Conversely, it’s very easy to end up living at the office for a job you hate and when that happens it might be time for you to #byopurpose. So it’s week one of my new life in Startupland (like Disneyland only MUCH more expensive and you can’t get off when you start to feel sick). And I can’t help but smile at the irony that it’s mental health week. Was I mental trading my well paid, highly respectable management consulting job in the city for a cash-strapped, home-office with no clients and no income? Well, probably. But I’m ok with being a little bit mental. I think we all are. Before I go on, I should qualify that statement in case one day someone other than my Mum actually reads this and takes offence at my use of the word ‘mental’ in this context. I am by no means trivialising the issue of mental health. On the contrary, I have personal experience of mental health issues and how debilitating they can be in all aspects of the sufferer’s life. So if, in the end, I prompt some discussion, thought or debate about this important and very real social issue then I figure that’s a good thing. As a consultant and (let’s be honest) salesman, I’ve long appreciated the importance of a thoughtful and compelling ‘elevator pitch’ (what you’d say if you only had a few seconds with someone in an American lift…its even harder in an Australian lift because our buildings tend to have less floors). When the only current frame of reference though, is what’s in your head (because version 372 of the business plan you updated before you left the house this morning has already been superseded… 5 times!) you can find yourself struggling. The truth is I really don’t know ‘what’ I’m doing because I haven’t done it yet. So to save myself (and those around me) from going completely mental, I’m focussing on getting clear about ‘why’ I’m doing it first. I’m confident that if I get that right, the ‘what’ will become a lot easier to explain! From the many corporate leaders, speakers and coaches I’ve worked with over the years, I’ve learned that an easy trap for anyone (never mind a startup founder) is believing their own BS (hopefully that acronym works without the *#! etc.) There is a difference between confident self-belief and arrogant naivety but sometimes even the most honest ‘hard look in the mirror’ still only tells you what you want to hear. So I’ve been out talking (and listening!) quite a bit this week. I’ve heard some things I wanted to hear and some things I needed to hear and importantly I haven’t heard anything that wasn’t helpful to me in some way. I’m definitely taking more than I’m giving at the moment but its amazing how willingly and gladly people give of their time if you ask them. 3. The value of time and money changes overnight – why I had to sack the gardener! When you are earning a salary you can easily put a $ value on your time. This helps you to make decisions (sometimes sub-consciously) about the trade-offs in life. What you will spend your time on vs. what you will outsource or pay someone else to do. In Startupland, you suddenly find yourself making very different choices and decisions that used to be easy are no longer easy. I suspect these decisions are going to get a lot harder but considering I have only just started, I wasn’t expecting to be letting someone go in my first week as a new business owner! Luckily our gardener was very nice about it and understood that a man needs to cut his own grass once in a while!